My Cozy Corner: I Keep it Everywhere!! WHERE DO I KEEP IT ALL? 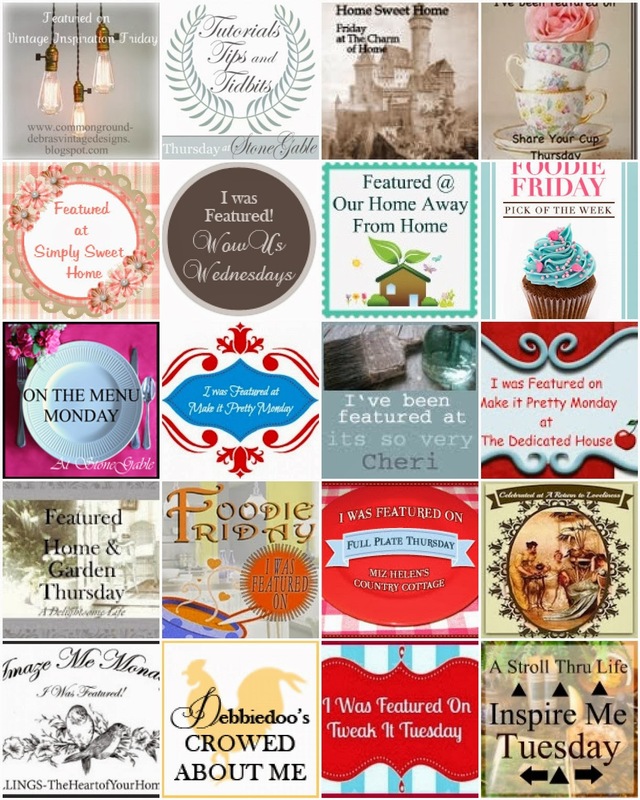 Before Blogging I loved dishes. But in the past year dish collecting has taken on a new meaning. 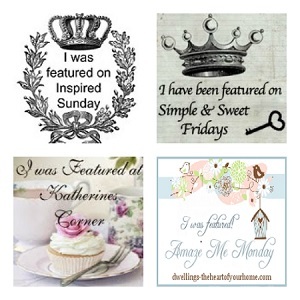 I'm always thinking about dishes and what centerpiece theme I would like to design. 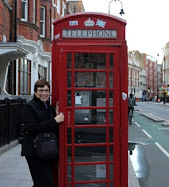 Blogging is a very creative outlet for me since my retirement. I love to touch, feel, wash and organize things. 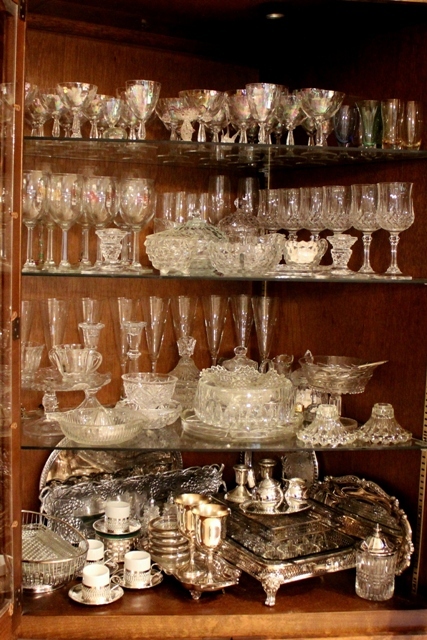 I like the way I put all the glassware on the top three glass shelves and the silver on the bottom shelf. I find it difficult sometimes to find places for my cake plates. 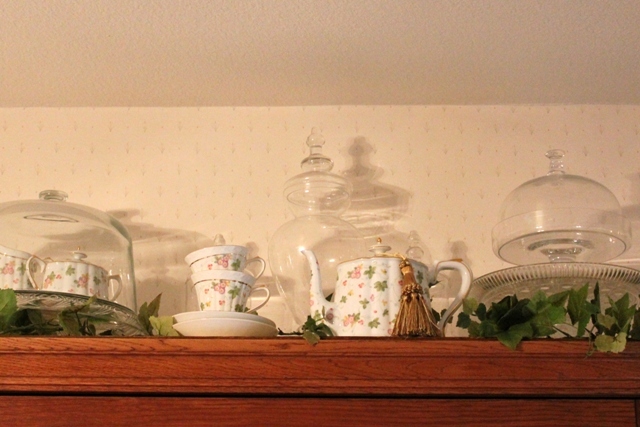 This display worked well, because it displays a complete tea set and glass cake plates plus my apothecary jars. 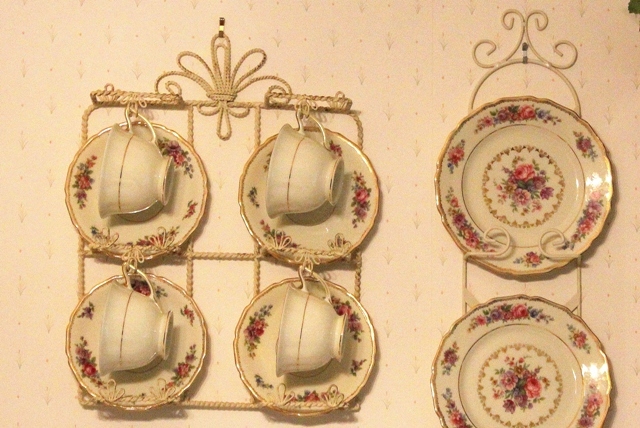 I love grouping my Tea sets together and this wall hanging is perfect for this tea set. The bottom of this cabinet holds the dining room television. The dining room and kitchen are one large room. I can watch television while I'm cooking. I covered foam core with yellow fabric and inserted it in the back of the cabinet shelves.. I think it added a punch with the blue and white dishes. 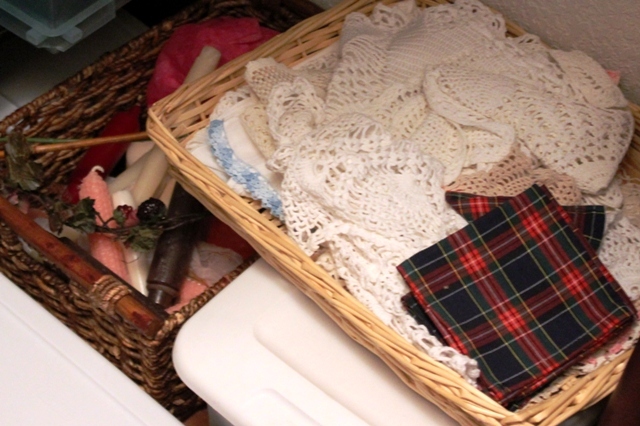 A shoe storage container stores the napkin collection. 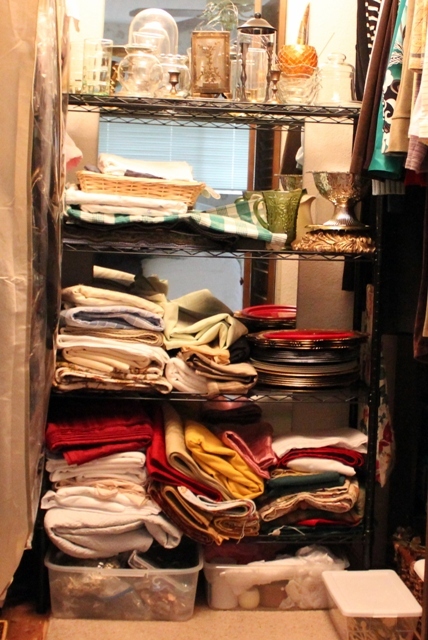 The guest room closet stores all the linen tablecloths, runners, centerpieces, chargers, napkin rings and candles. I always iron the tablecloth and napkins before a arranging a tablescape. 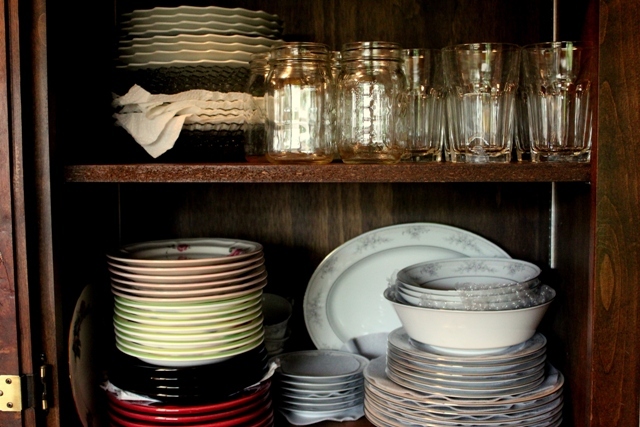 Your dishes are beautiful! I love all the ones with roses ( I love pink) and the blue & white! I like the shoe storage container idea. Thanks for sharing your storage secrets with us. YOu have some wonderful storage places. 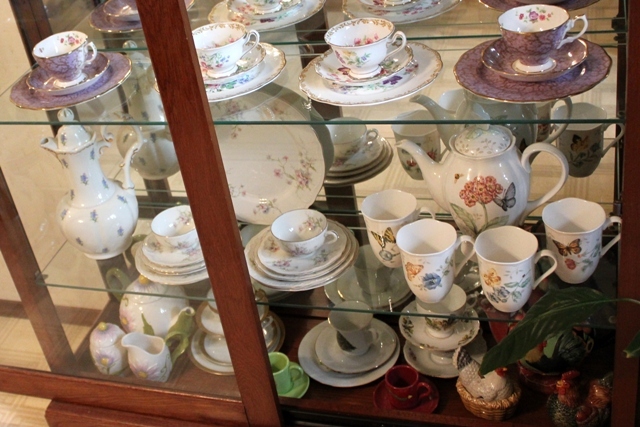 I love your cabinet filled with tea things! It's like stepping into a party. Thanks so much for coming to my party! It's been so much fun having everyone share. So many prety storage areas! And everything looks just so beautiful! thank you for inviting us in for a tour! 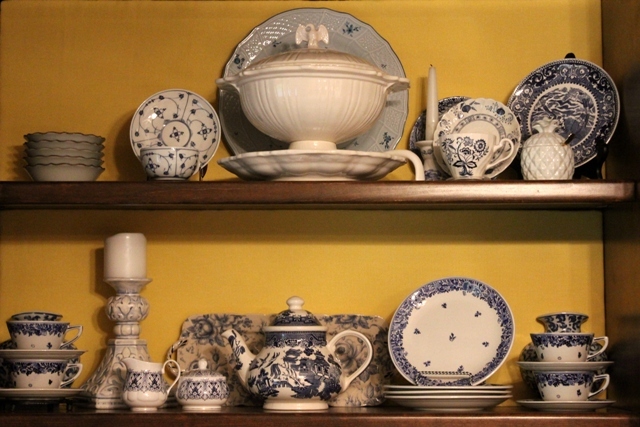 I love how you backed your blue and white china with the yellow. It really does make it pop. You've got some great storage areas. Thanks so much for sharing them. You've been very creative and it all looks great and beautifully organized. Wow you do have everything packed and stored very well. Great job. Oh my! I think we would have great fun together. 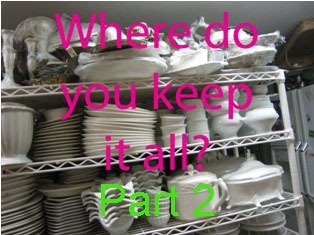 I love dishes and have mine stored anywhere and everywhere...love love love your storage ideas. What a wonderful assortment of dishes you have. 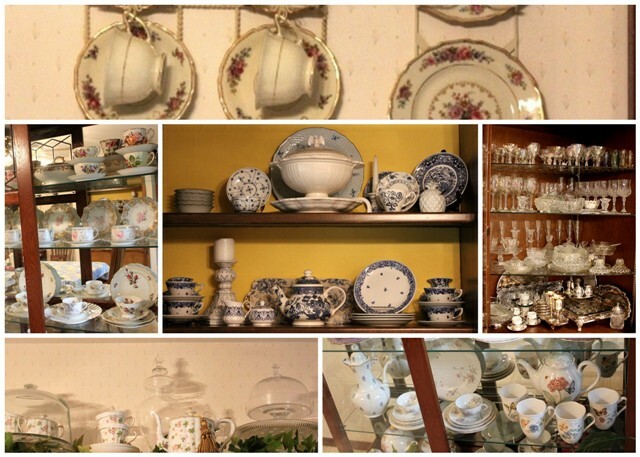 You have all your china and crystal arranged so beautifully. I love all your dishes and your hanging tea set is so cute! 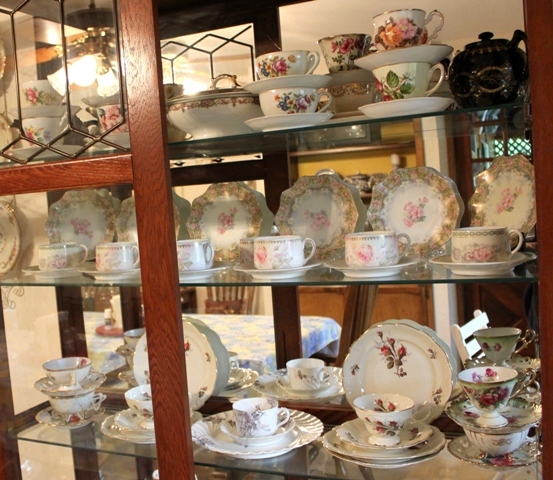 I noticed your Butterfly Meadow teapot and mugs; I have some of those dishes. Thanks for sharing. Love the plate, cup and saucer wall holders!! !